Death and pain dominate this world, for though many are cured, they leave still weak, still tremulous, still knowing mortality has whispered to them; have seen in the folding of white bedspreads according to rule the starched pleats of a shroud. The world is not with us enough. Pergo Park knew me, and Clavering, and Havering- atte- Bower, Stanford Rivers lost me in osier-beds, Stapleford Abbots sent me safe home on the dark road after Simeon-quiet evensong, Wanstead drew me over and over into its basic poetry, in its serpentine lake I saw bass-viols among the golden dead leaves, through its trees the ghost of a great house. Let’s go—much as that dog goes, intently haphazard. I don’t think one can accurately measure the historical effectiveness of a poem; but one does know, of course, that books influence individuals; and individuals, although they are part of large economic and social processes, influence history. Every mass is after all made up of millions of individuals. 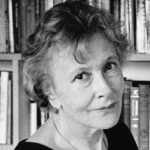 Denise Levertov was born in Ilford, Essex, England. She was a British-born American poet, essayist and political activist. She published her first poetry collection, The Double Image, in England in 1940. Seventeen years later, she had her American collection, Here and Now, released. In the 1960s, Levertov was active in the anti-war movement in the United States. Levertov's political and social activism could be seen in such collections as The Sorrow Dance and To Stay Alive. Additionally, she worked as a poetry editor for The Nation in the '60s and for Mother Jones in the '70s. She wrote her most personal essays in her 1995 book, Tesserae: Memories and Suppositions. She won the Lenore Marshall Poetry Prize in 1975 for Freeing the Dust.